Description: Level: Lean factory design, automation and control engineers, visual assembly factory designers, quality control engineers, engineering managers, factory control software / IT developers, operations managers, team leaders, workforce productivity improvement managers, students & faculty, interested in eliminating unnecessary waste, lost time, and workers' compensation costs by improving and automating factories, and literally any business by means of Visual Factory Management & Control (VFM) methods and technologies. Also ideal for undergraduate / graduate education and research learning about lean, Kanban, quality assurance, waste reduction and dynamic JIT (Just-in-time) factory control. Industrial Sponsors/ Contributors include with special thanks to Bryan Denbrock, Manager, Production, Denso Manufacturing Michigan, Inc., Battle Creek, Michigan, USA, to Akihiro Taguchi, Chief Engineer, Body Electronics Components Product Division, Denso Corporation, Takatana Plant, in Japan, and in the USA: Bryan Denbrock, Manager, Production, Karen Cooper-Boyer, General Manager, Human Resources, Corporate Services, Sarah Frink, Senior Communications Specialist, Marlene Goldsmith, Senior Manager, Corporate Communications, and Alessia Razzeto, Public Relations Specialist, at Denso Manufacturing Michigan, Inc., Battle Creek, Michigan, USA, CIMware Ltd. UK, CIMware USA, Inc., and others. 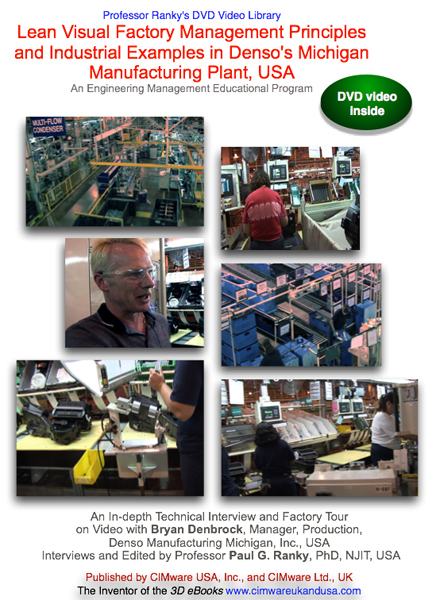 Contents: This publication is a professional quality DVD video factory tour, covering Denso lean manufacturing system solutions in a Visual Factory Management & Control (VFM) framework. VFM is an integrated set of methods and technologies for the purpose of reducing waste at all levels, improving profitability, increasing lean production control, product & process quality, productivity, safety, on-demand / just-in-time (JIT) Kanban production / delivery, and employee morale in a factory, or virtually in any business. VFM and factory automation typically begins by following an integrated process, requirements, and risk analysis method, embedded into a statistical analysis and multimedia framework. As a result, the team will have a clear picture about what needs to be done, when, and how. The next step is typically the implementation of a 'Five S', a 'Lean Six-Sigma', and a 'Monozukuri' program. (See more about these methods and technologies in Professor Ranky's Library.) See also Part 2 of this program! System Requirements: DVD-ROM: NTSC standard definition (SD) DVD video player for TV, or computer. Approximate length 29 minutes, in 16:9 widescreen format, also playable on a 4:3 regular screen, or any good computer screen (800 x 600 resolution, or better). Furthermore available in PAL DVD video, in streamed digital, and Apple Video iPod formats. The HD (high-definition NTSC and PAL) formats are also available as soon as the HD DVD standard is finalized and players are available. Please visit on the web www.cimwareukandusa.com for available formats, and further relating titles & products. See also Part 2 of this program! Sample video clips in low-res.